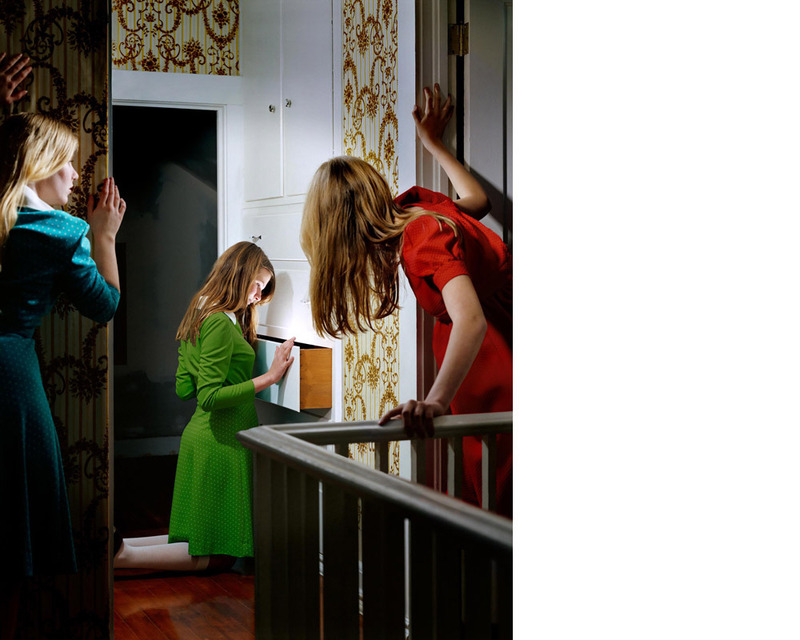 Holly Andres – Light research and colour. My Research of this artist came about due to organising a trip to New York as I was choosing the galleries all past and present artist exhibited at some of the largest galleries. 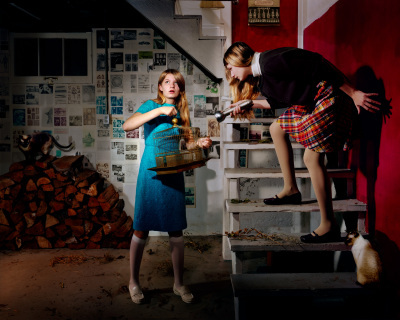 Andres image in her Sparrow lane exhibit are using girls usually on the cusp of Adolescence. There is a sense of anxiety in her image like what the girls are doing or about to discover is forbidden. Despite beautiful, clothes, hair, and bright colours there is anxiety in all of these image. These are staged images and yet I feel the anxiety the fear of being caught doing something I should not is passed to me through the images. I love also the great saturation of colour and the use of strong bold colours in all her image. In the above image note the almost golden light coming out of the drawer indicating as if there is treasure illuminated in the drawer. Is this the treasure of knowledge. Outside the door is dark and there seems almost like a ghostly figure there it adds to the psychological effect. The girls are all perched anxious there hands and even fingers showing the anxiety. The line of the bannister here leads us directly to the girl looking in the drawer before then looking at the rest of the image and understanding the sense of forbidden of their actions. Again the great use of light on the childs face to me could represent the delight in the forbidden or hidden secrets in the bag she is looking into. The sense of looking for something heightened by the girl looking under the bed. Mystery and anxiety are created in the image. Although we know the images are staged the expression of the girls face rings true. the line created from her to the other girls until we see one of them climbing into an attic area. There is suspense a sense of danger here. Before I noticed the scissors in this image which was the last thing I saw I noticed the stance of the girl in black legs apart almost on her toes, fingers outstretched they give a sense of anxiety. The reflection of the youngest girl in the mirror shows fear. The forbidden room this image does not really need a title. We can see from the girls expressions the anticipation before entering the room. The large key in the small hand of the little girl indicating this is not a key she is old enough yet to hold. As I am currently studying light Andres uses light in a fascinating way in this image how the light shines on the girls and creates shadows behind all adding to the interest of the image. I have used this as inspiration in Assignment 4 my colour and unusual light. It is not the same technique however the spot light shining on the hand bag which the little girl is holding looks like gold light is coming out of it. It made me think of an idea for my basil leaf in Assignment three. I have bounced the flash light off a yellow item which reflected yellow onto my leaf. I wanted to give a feeling of spring, fresh and crisp. The flavour and small off the basil. ← Inspiring Photographer – Walker Evans – Narrative research.